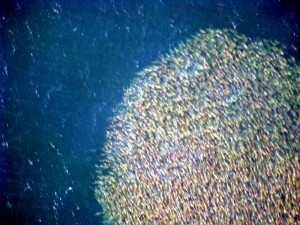 Amazing aerial shot of a HUGE school of Red Drum on the Carolina Coast. Our area is one of the few in the world where you’ll see such a site….. Drum of this size….50 pounders….can be up to 40 years old! Even though they are delicious at the dinner table, these drum are busy spawning, so if you are lucky enough to land one don’t get too attached…..drum over 27″ are all catch and release. Rig of choice: Lupton. Bait of choice: fresh cut mullet on a circle hook. 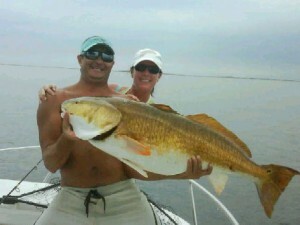 Our friends happened in the right place at the right time the other day and reeled in a couple of monster red drum. Nice work Garcia’s! 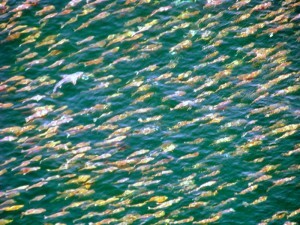 Our local waters come alive this time of year. 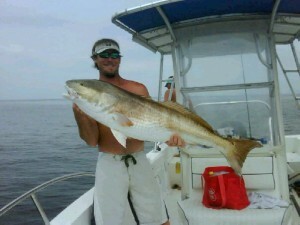 Drum, tarpon, crabs, shrimp, flounder and speckled trout all call the waters coastal Carolina home. Add this to the long list of reasons why life on the coast is so appealing to so many.